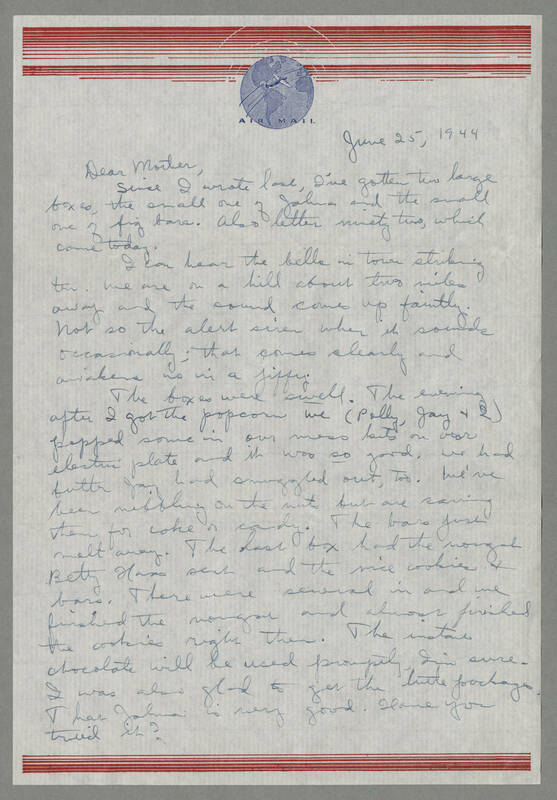 June 25, 1944 Dear Mother, Since I wrote last, I've gotten two large boxes, the small one of Johns? and the small one of fig bars. Also letter ninety two, which came today. I can hear the bells in town striking ten. We are on a hill about two miles away and the sound comes up faintly. Not so the alert siren when it sounds occasionally; that comes clearly and awakens us in a jiffy. The boxes were swell. The evening after I got the popcorn we (Polly, Jay & I) popped some in our mess kits on our electric plate and it was so good. We had butter Jay had smuggled out, too. We've been nibbling on the nuts but are saving them for coke or candy. The bars just melt away. The last box had the nougat Betty Haas sent and the nice cookies & bars. There were several in and we finished the nougat and about finished the cookies right then. The instant chocolate will be used promptly, I'm sure. I was also glad to get the little packages. That Johns is very good. Have you tried it?